Russian artist Roman Booteen specializes in the art of the hobo nickel, or to be more specific, the sculptural art form involving the creative modification of small-denomination coin. He’s known for several pieces, including a Gold Bug that was inspired by Edgar Allan Poe’s short story, The Gold Bug, and one of his newest pieces with a hidden gold chalice. Many of his coins have been sold on auction sites online (eBay, WorthPoint, etc. ), and have fetched as much as $3,100. Read more for a video and additional information. 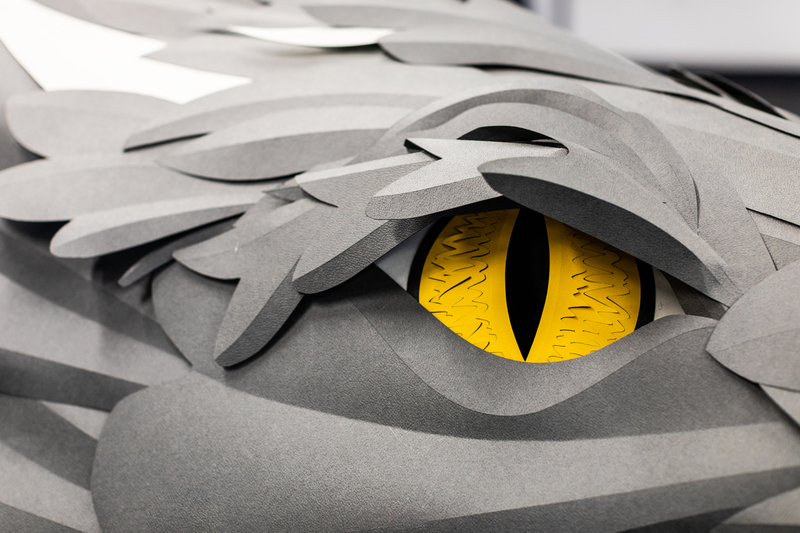 To celebrate the premiere of the eighth and final season of Game of Thrones on April 14th, British office supply company Viking employees teamed up with artist Andy Singleton to create a giant 43-foot, fire-breathing paper dragon. How long did this all take? Around 10-days, with an additional 10-hours required to piece everything together. Read more for a video, additional pictures and information. Thomas “Painter of Light” Kinkade paintings are known for their glowing highlights and pastel colors, but artist Jeff Bennett wanted to add a geeky twist to some of his favorites in the form of Star Wars. You’ll see plenty of Stormtroopers setting Kinkade’s idyllic scenes ablaze and even Star Destroyers appearing in the fluffy clouds. Read more for additional pictures and information. French street artist JR has just unveiled his latest work in Paris this past weekend, and it does not involve Photoshop. To commemorate the 30th anniversary of the Louvre Museum’s stunning glass pyramid, he, along with 400 volunteers, pasted 2,000 sheets of paper around an I.M. Pei design to make it appear as if it’s rising out of a quarry. “Once pasted, the art piece lives on its own. The sun dries the light glue and with every step, people tear pieces of the fragile paper. This project is also about presence and absence, about reality and memories, about impermanence,” said the artist. Read more for a video, additional pictures and information. The Carrières de Lumières is basically a digital art center projecting immersive exhibitions located in the Baux-de-Provence. This year, they have an incredible Vincent van Gogh exhibit that lets you virtually step into his paintings. How? It’s all thanks to AMIEX technology, which is based on a state-of-the-art video installation, complete with specialized sound, adapted to the constraints of the venue, tailored to perfectly match the space it’s being used in. Read more for a video and additional information. At first glance, “Horizons” appears to be a larger than life piece of paper, but it’s actually just a clever optical illusion by New Zealand artist Neil Dawson. This massive steel sculpture is designed to look like a windblown piece of paper resting on a hilltop, and made its debut in 1994 for Gibbs Farm, an outdoor sculpture collection in New Zealand. Read more for a video, additional pictures and information. Artist and master woodworker Scott Huebner specializes in creating other worldly sculptures that fuse burl – a tree growth where the grain has grown in a deformed manner – with resin. Burls are normally found on the trunk, at the tree’s base, and sometimes even underground in the form of a rounded outgrowth, thus resulting in uniquely patterned wood, which is perfect for these types of sculptures. Read more for a video, additional pictures and information. Artist Matt Wilson specializes in transforming old cutlery, whether they be spoons, forks, or knives, into amazing animal sculptures, like birds. When he’s not making these works of art, he dabbles in driftwood and scrap metal, finding ways to turn those into masterpieces as well, with some pieces making their way onto Etsy. Read more for additional pictures. Coffer appears to be a normal chest at first, but this amazing project by metal-smith Seth Gould took 2 years to complete, and is actually a puzzle box made entirely from wrought iron, pure iron, steel and brass. What makes it even more amazing is that all the parts, screws and springs included, were handmade. The forging was done using a coal forge, hammer, anvil, and power hammer. Once the pieces are close to their finished shape, they were moved to the bench to refine the surface and then shaped with a file. Read more for a video, additional pictures and information.